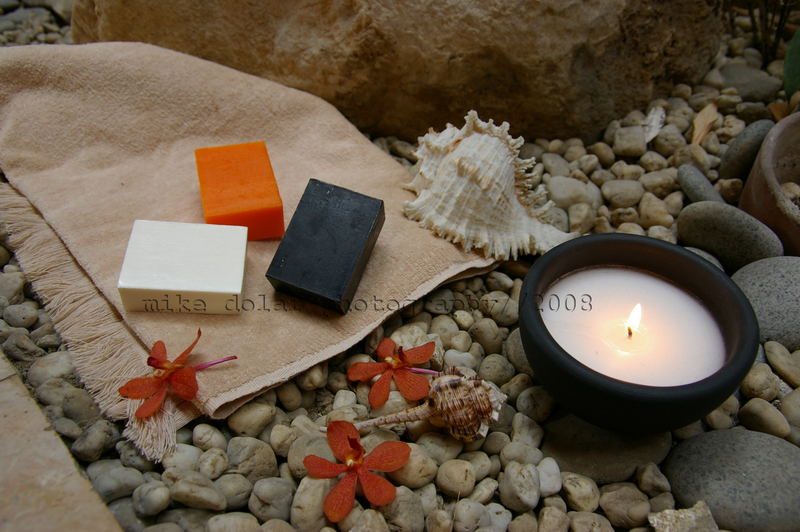 elements of a spa and bathing ritual | let's go pinas!! Bathing has gone a long long way. It is no longer just rushing to the bathroom to take a shower, and scrubbing yourself with some germicidal soap, and if need be, lathering the hair with some liquid substance. Bathing has become a luxuriating experience that has been extended to an art of relaxation and rejuvination – ala spa therapy. One can now soak into the tub of warm water, sprinkled with bathing salts that not only improves health condition, but can even loosen tensed muscles. As bathing today may involve all senses, one can get a whiff of the scents from the oils placed in a lit aromatherapy burner and let the candle light undulate while pampering your skin with an array of bars of gentle soap. And if one has more than enough time, one can indulge in a footspa or some handmassage while catching up some reading on some lifestyle magazines. And to cap off a sensual moment, why not spray on some air freshner to the corners of the bedroom and even to the bedlinen for a goodnight rest. Let all of these bathing and spa experiences create a new person in you, using all the available soaps, scents and oils, including from Caliko. In fact, why not mix some pleasure with business by being a local distributor of these Caliko products in your area. Please call Aimee at 09228965556, and get all the benefits from Caliko. This entry was posted on September 17, 2008 at 2:03 pm and is filed under artifacts, lifestyle with tags airfreshner, bathing salts, bleaching soap, body warming oils, caliko, hand sanitizer, insect repelant, kojic soap, massage oils, philippine aromatherapy, philippine soaps, philippine spas, philippines, scented oils. You can follow any responses to this entry through the RSS 2.0 feed. You can leave a response, or trackback from your own site. pls check given number in the blogpost. thanks. I wanted to be a reseller of your spa products. Please send me product/price list. hi, im interested in reselling/distributing your products. please email me details. hope to hear from you soon!